The sun is back but the puddles are still here...reflecting the steeple of Menton's Basilica. 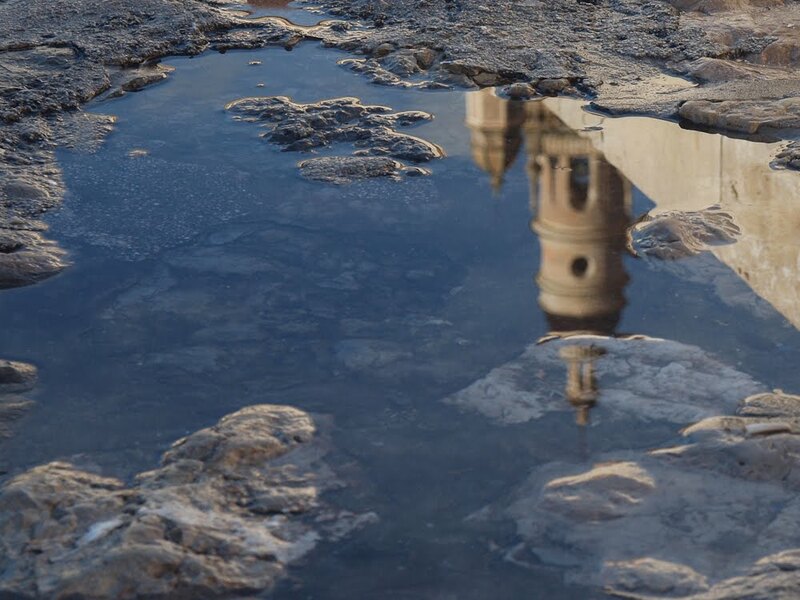 Le soleil est de retour, mais les flaques d'eau sont toujours là ... qui reflètent le clocher de la Basilique de Menton. And the blue sky is reflecting as well! You have lovely pictures in your blog, I find them interesting and beautiful, thank yuo for sharing! Nice one. The stones look like clouds! This is a beautiful photo great reflections. A very familiar scene in my country at the moment, and not just in Queensland, but in each state down the eastern seabord. WOW! Amazing shot with beautiful reflection. Aaaaaah, beautiful colors and composition... this one really grabs me for the reflection, the spires, the colors, the stones...and the uncontrollablel urge to look "up." I am not sure what it is about a reflection shot that makes them so attractive. Maybe it's the composition, maybe the sense that you are seeing a bonus view in addition to looking at the subject directly. Whatever it is, yours is a good illustration of what makes reflections shots so pleasing. Wow! Save this one for the next photo show in Menton, Jilly. The basilica tower is Menton's icon. That is one of the nicest reflection photos I have seen recently. Thanks for the kind comments, everyone. Have to say people look at you very strangely when you walk along looking in puddles and moving about to get the shot right! I imagine most people think we're crazy when we find beauty in the puddle at our feet!